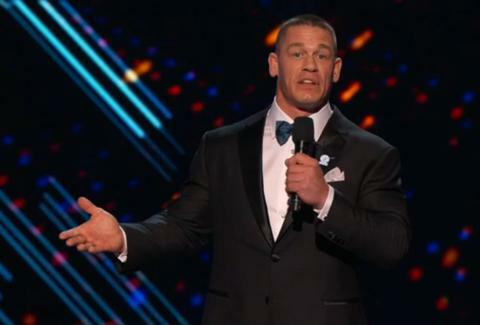 Professional wrestling superstar John Cena was tapped to host the 2016 ESPYs on Wednesday night. He may have been an odd choice for ESPN to tag as their host, given that he's a star of sport's weird cousin. But that provided the fodder for his opening schtick at the year's biggest sports award show. Wrestling's hodge podge of sport and entertainment is famously staged, and Cena, like Ayesha Curry before him, proposed that sports might have more in common with wrestling than it most care to believe. He likened WWE's maniacal billionaire puppetmaster Vince McMahon to unpopular NFL commissioner Roger Godell. He also pointed out that LeBron James's turn from hero to heel to hero makes him the perfect wrestling character. The monologue came off well, even if a few jokes tanked. He did it right, toeing the line, going after Kobe Bryant's inability to pass in his final season, J.R. Smith living without a shirt on after winning the NBA championship, and the potential for disaster at the 2016 Summer Olympics in Rio. It was a nice change of pace from the traditionally tepid opening monologues at the ESPYs. Watch his full opening monologue to the 2016 ESPYs below.